Welcome to Board Watch for WCCUSD’s September 7th Meeting! The September 7th Board of Education meeting marked our school board’s first gathering of the 2016-17 school year. Superintendent Matt Duffy shared his experiences and early impressions from visiting schools and classrooms during WCCUSD’s opening week. 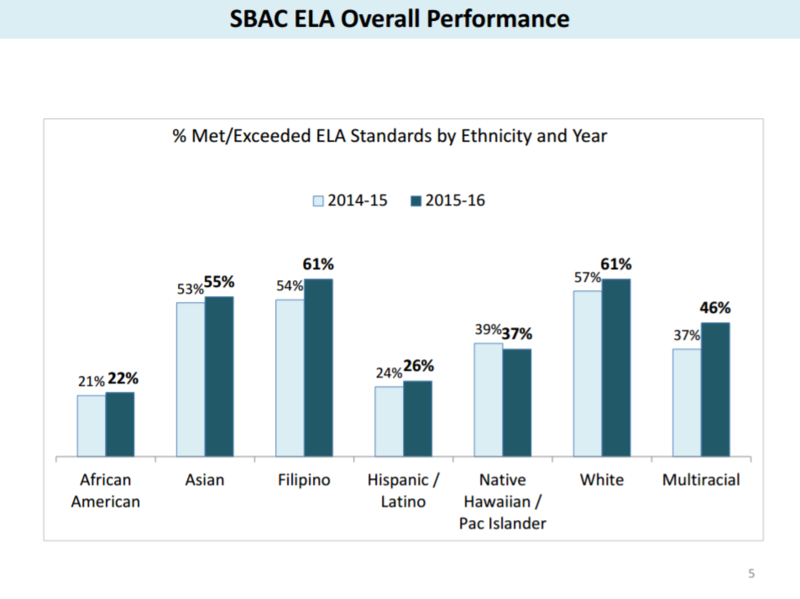 The Board also reviewed SBAC test results from the 2015-16 school year and approved several consent items, including a response to a Contra Costa County Jury report relating to truancy and chronic absence in Contra Costa schools. 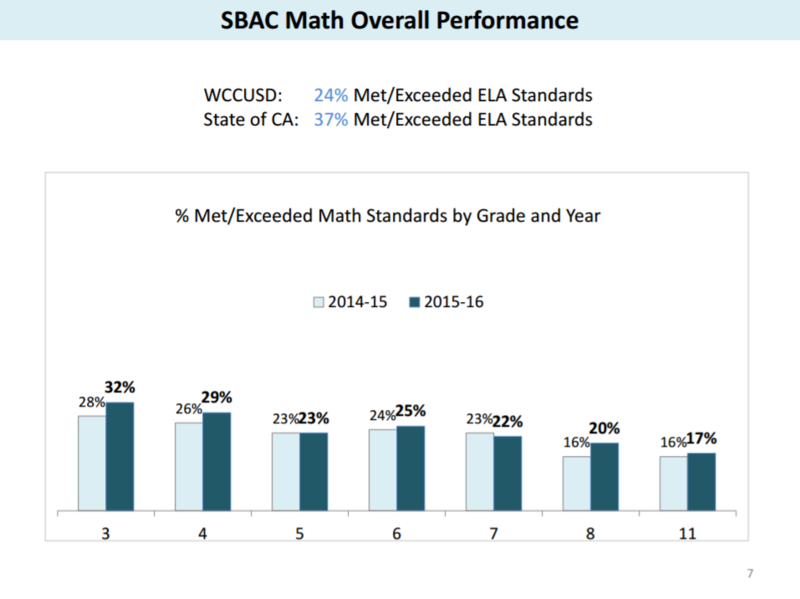 WCCUSD Director of Accountability Nicole Joyner reported on the district’s Smarter Balanced Assessment Consortium (SBAC) test results from the 2015-16 school year. 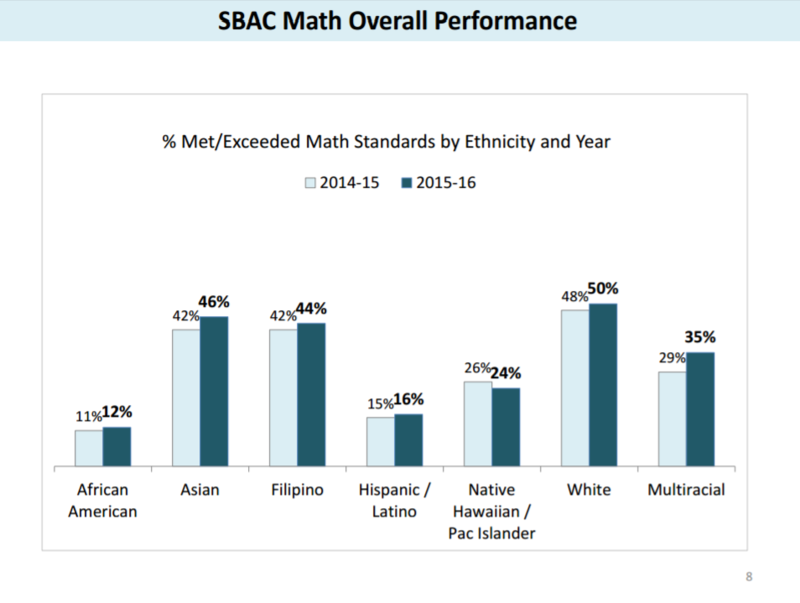 SBAC tests focus on English Language Arts and Math standards, and are taken by students in Grades 3-8 and Grade 11 to help measure progress towards college and career readiness. Based on performance, students are ranked on four achievement levels: Standard Exceeded, Standard Met, Standard Nearly Met, and Standard Not Met. Students are also assessed on three claim areas: Above standard, At or Near Standard, and Below Standard. The district tested 95% of all students enrolled. Below are screenshots of our students’ performance by grade, year, and ethnicity. State-level performance is included as well. Ms. Joyner highlighted schools that yielded positive results such as Crespi Elementary’s 6% growth in ELA performance and Kensington Elementary’s high rate of students meeting or exceeding standards (85% in ELA and 78% in Math). Joyner offered up that it will take time for teachers and schools to acclimate to the new Common Core educational standards. Assistant Superintendent Nia Raschidchi also shared various teacher resources, professional developments, and technological trainings that WCCUSD is implementing to support and develop teacher capacity. 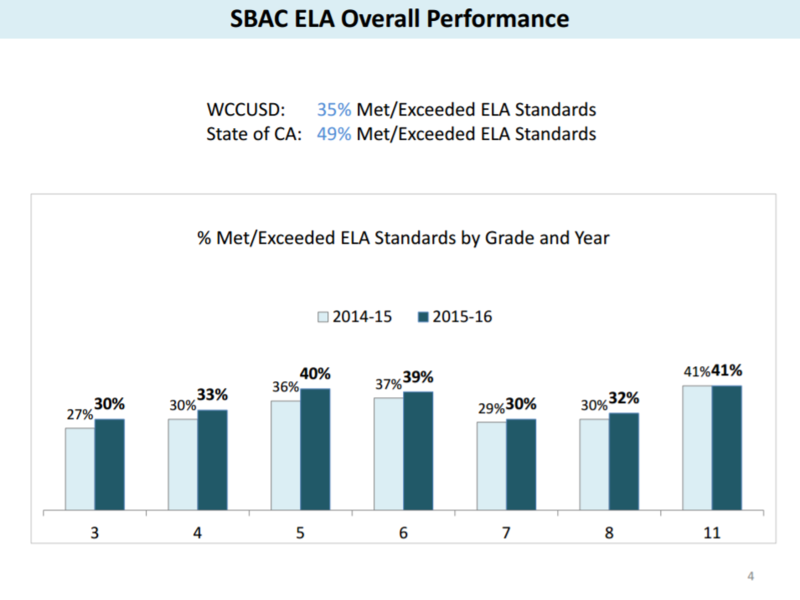 President Randall Enos capped off discussions by stating that the scores were a “good indicator of where improvements can be made.” The Board plans to revisit this discussion once the SBAC data is sorted by school site. Click here to review the SBAC Presentation. Duffy visited seven school sites, including Nystrom Elementary and Richmond High, and shared a freshman orientation video filmed and edited by Richmond High Students. He also updated our school board on key district-wide information, reporting that WCCUSD has higher enrollment numbers as compared to the beginning of the prior school year (168 more students), especially in Kindergarten. Duffy also informed the school board of a continued need to balance classes and focus on staffing, as the district is currently short on one elementary and six secondary teachers for the 2016-17 school year. Click here to view the Superintendent’s Presentation. WCCUSD is required to respond to a Contra Costa County Grand Jury issued report 1615: Truancy and Chronic Absence in Contra Costa County Schools. The report suggests that chronically absent students are at higher risk of dropping out and falling into the prison system, while noting the implications this has on school district funding. 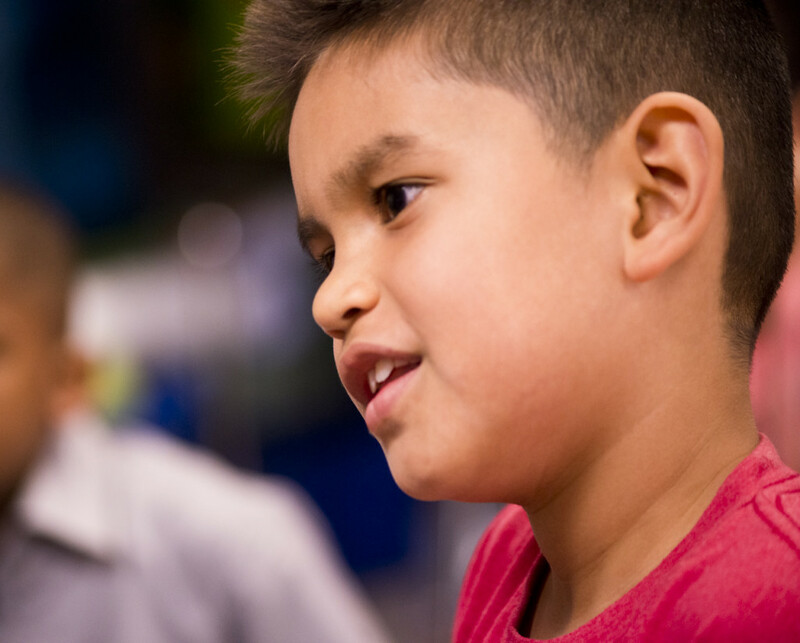 The report suggests cross-district collaboration in sharing best practices and resources to educate parents and students on the importance of attendance. During the September 7th meeting, the board approved the response linked below as an item on the consent agenda. Click here to review the district’s response to the Grand Jury report.